Cello or Violoncello, large, low-pitched musical instrument of the Violin family, held between the performer's knees. It is really a bass violin played in an upright position. It has four strings tuned C G d a (C = two C's below middle C; a = the A below middle C). Its range extends over more than four octaves. It is mostly used in string-quartets and orchestras. The Tail spike is used to balance to Cello when being played, it can be adjusted to any size, and retracts back into the Cello when not in use. The tuning pegs at the Pegbox are used for tuning the Cello, but for real accuracy, the fine tuners are used. 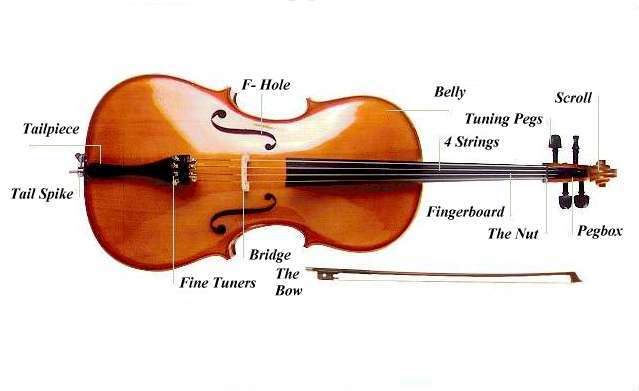 The f hole is used to increase the resonance of the Cellos body, thus making the sound produced louder. The 4 Cello strings are thicker that those of the Violin, and are better suited that way to give the Cello its unique sound. The Cello is played by rubbing the bow string over the Cello strings, both in left and right directions. The earliest surviving Cellos are two from the 1560s by the Italian violinmaker Andrea Amati. Until the late 18th century the Cello was only a supporting instrument, playing bass lines and adding fullness to musical textures. During the baroque era unaccompanied Cello suites were composed (1720?) by the German composer Johann Sebastian Bach, as were Cello concertos by Antonio Vivaldi and Luigi Boccherini, the Italian composers. In the 19th century, works for the Cello included concertos by Johannes Brahms and the Czech composer Antonín Dvorák. In the 20th century, composers such as the Russians Sergey Prokofiev and Dmitry Shostakovich further explored its solo capabilities. The most prominent 20th-century cellist was the Spanish-born Pablo Casals. Other leading soloists are the Russian-born Gregor Piatigorsky and Mstislav Rostropovich. Also, up until the 19th Century, women didn't play the Cello, as its playing position was considered "unladylike" for women.